Jing Chen, PhD with Emory and Winship leadership and members of the Rollins family. From left to right: Walter J. Curran, Jr., MD, Pam Rollins, Jon Lewin, MD, Amy Rollins Kreisler, Jing Chen, PhD, R. Randall Rollins, Claire E. Sterk, PhD, and Sagar Lonial, MD. Chen, who serves as co-leader of the Cancer Cell Biology Research Program within the Winship Cancer Institute (Winship), is one of the foremost authorities in cancer metabolism and growth. His research focuses on mechanistic understandings of metabolic reprogramming and rewiring in cancer cells and the pathogenic link between diet and cancer. "We are absolutely thrilled to recognize and honor Dr. Chen with the R. Randall Rollins Chair in Oncology," says Walter J. Curran, Jr., MD, executive director of Winship. "In addition to his outstanding contributions in cancer research, one of his greatest contributions to Winship is his mentorship of many outstanding trainees." "Jing Chen is a wonderful example of someone who started his academic career at Emory and is now giving back through his innovative cancer research," says Sagar Lonial, MD, chair of the Department of Hematology and Medical Oncology. "He serves as a role model for other young investigators who can see and understand how their science might transform cancer care." 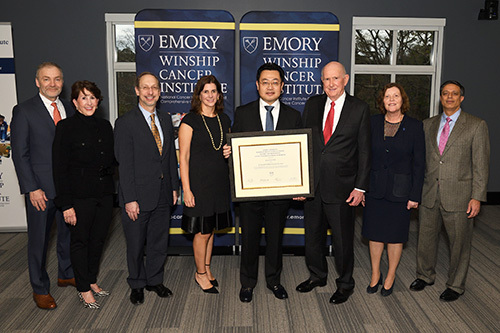 In 2017, Chen received the Winship Cancer Institute Research Mentorship Award. He has authored more than 50 peer-reviewed articles and is credited with identifying specific dietary factors that may one day explain the first real link between diet and patient outcomes in a cancer model. Chen is the principal investigator of three National Institutes of Health R01 awards. He has received research funding from the U.S. Department of Defense, the Leukemia and Lymphoma Society, the American Cancer Society, T.J. Martell Foundation, and Multiple Myeloma Research Foundation. He was named a Georgia Cancer Coalition Distinguished Cancer Scholar in 2006 and a Winship Cancer Institute 5K Scholar in 2014. "Our family and foundation are proud to honor Dr. Chen with the R. Randall Rollins Chair in Oncology. We are grateful for his groundbreaking contributions to cancer research," says Amy Rollins Kreisler, executive director of the O. Wayne Rollins Foundation. Chen received his PhD in biochemistry from Emory University in 2001 and joined the Emory faculty three years later. In 2016, he received the Distinguished Alumnus Award from the Graduate Division of Biological and Biomedical Sciences at Emory's Laney Graduate School.